A new QUEENSRŸCHE song titled "Arrow Of Time" can be previewed in the YouTube clip below. The track, which was first made available to those fans who took part in the PledgeMusic campaign for QUEENSRŸCHE's new album, can be streamed in its entirety at SoundCloud.com. The new QUEENSRŸCHE CD is tentatively due in October. The album was recorded in part at at Uberbeatz Studio in Washington with producer Chris "Zeuss" Harris, who has previously worked with ROB ZOMBIE, HATEBREED, SOULFLY and SHADOWS FALL. In a recent interview with "Hard Time Radio" on KNON 89.3 FM in Dallas, Texas, QUEENSRŸCHE vocalist Todd La Torre stated about the band's follow-up to 2013's "Queensrÿche": "We're really excited about the songs. We put a lot of into it, and hopefully the fans really dig it. You never know. It's so subjective, but there's such a diversity, I think, of material that, surely, there's something for everyone — kind of like on the last record… There's some stuff that sounds like it would be from the 'Mindcrime' era, there is a couple of songs that sound like they could have been from 'Empire'. There's also some tunes that could have been from the 'Rage' and 'Warning'…"
He continued: "Honestly, I know it sounds typical or cliché to say, but I really feel that there's material on this record that spans from the first record that the band did up to 'Empire' and maybe even 'Promised Land'. There's a lot of diversity, but there's a complexity to these songs… It's a different animal to the last record. The last record was awesome and we're very proud of it. This one is a lot more involved, [with] a lot more layers. And I think, vocally speaking, I was able to do some things on this record that I didn't get to do on the last one, just because the material maybe didn't call for it, but this stuff does. There's some really dark and slow and haunting, creepy stuff on here. There's just a lot of… I don't know… It's hard to compare it to anything. So that's why I think that the best thing I can say is I think that there's something for everyone on this album; I really believe that… The drumming on this is so good, the bass… the rhythm section, the bass playing of Eddie [Jackson] locks in with Scottie's [Rockenfield] kick drum. I mean, the guitar work that Parker [Lundgren] and Michael [Wilton] did really shines. And a lot of great harmony guitar work that was so evident in the QUEENSRŸCHE sound is very vibrant on this record in certain places. Everything was microscoped to every single, tiny little detail that… no expense was spared. We didn't wanna overdo everything." Todd added: "Sometimes you can go a little crazy, and you have to learn when to say 'enough is enough.' And Chris 'Zeuss', our producer, who also engineered the record, he was very mindful of the QUEENSRŸCHE style and sound, and he was a huge fan of the band, so he definitely wanted to capture those pure QUEENSRŸCHE elements, but also make the band sound like it should sound in 2015. It doesn't sound dated, but there's still that QUEENSRŸCHE sound. It is a different lineup, and there's a new energy, and there's a drive that this record has that, I think, is really refreshing. And sonically speaking, it just sounds… it sound killer. It sounds killer. I'm super excited for this record to come out. I think it's definitely a great step." Regarding QUEENSRŸCHE's collaboration with Chris "Zeuss" Harris, La Torre said: "He was right at the forefront of the metal scene that was happening up in the New England area, with the style of SHADOWS FALL and KILLSWITCH ENGAGE, and that kind of stuff. So he was immersed into that genre of metal for a long, long time. And he did the new SANCTUARY record, which sounds really great. And so he was super excited to get it to the territory of music that QUEENSRŸCHE does, and he handled it with extreme respect and care, but he wasn't afraid to say 'no.' If he didn't think it was the best, he had no problem respectfully saying, 'No. That's too happy.' Or, 'That sounds kind of corny.' Or, 'You can do better'… to all of us. And he really pushed us to do the best that we could respective to each song. So, yeah, he was very eager and enthusiastic and honored to work with QUEENSRŸCHE, and we were equally… felt the same way to have him do this record." 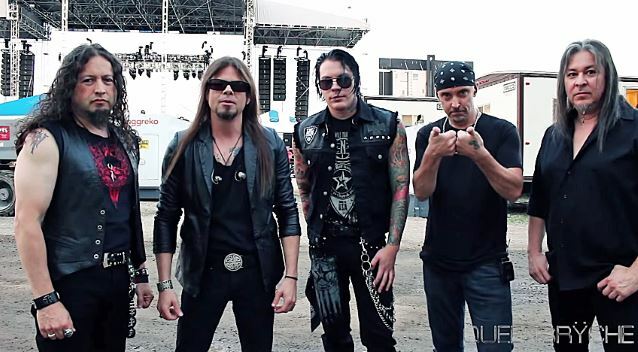 "Queensrÿche" sold around 13,500 copies in the United States in its first week of release to land at position No. 23 on The Billboard 200 chart.